Victoria Pendleton and Ben Fogle. Photo Credit: British Red Cross. 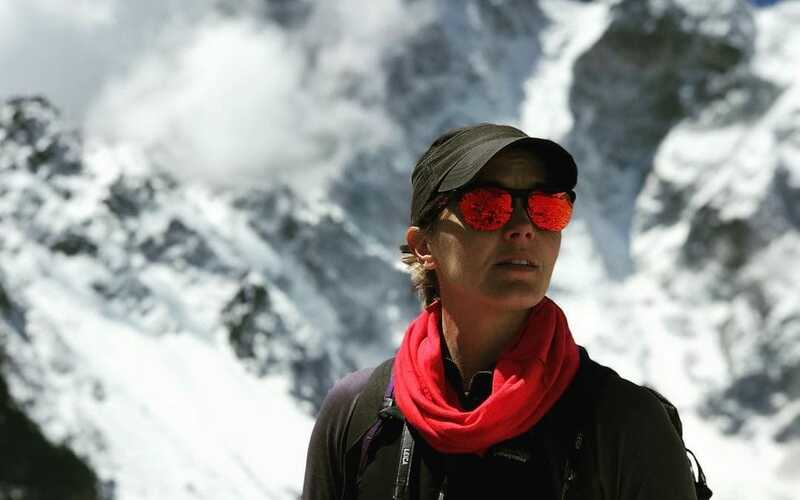 Former Olympic cyclist Victoria Pendleton has been forced to abandon her Everest climb. Pendleton was advised by medics to descend from Camp 2 due to acute hypoxia. Her blood oxygen levels were as low as 28% – normal readings at sea level range from 95-100%. While she was physically strong, physiologically she struggled to cope with the thin air. Her oxygen saturation was worryingly low. At sea level most of us would record a healthy 99/100%, anything lower than 95% and you’d probably find yourself in Casualty, at Camp 2 Victoria registered 28%. That’s nearly dead. We rushed her onto oxygen and dexamethasone, to prevent HAPE, High altitude Pulmonary Edema. It was pretty scary for all of us to say the least. Pendleton was aiming to climb Everest to raise money for the British Red Cross, along with Ben Fogle, the television presenter and UN Patron of the Wilderness. 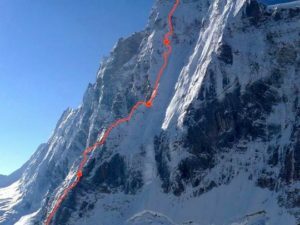 Kenton Cool, who has already summited Everest 12 times, and Fogle remain on the mountain waiting for their summit bid. I have been unable to adhere to the prescribed rotation program and keep pace with the team without causing concern regarding my health at the higher camps, due to my lack of adaptation to the extreme altitude. It’s natural to assume that Pendleton, a former elite athlete, would excel at altitude. More than past athletic prowess, however, physiological adaptation to altitude dictates success or failure on Everest – and here’s the reason why. It’s a point of confusion to say that air is “thinner” at altitude, or that there is a lower percentage of oxygen – suggesting a change in the composition of air. In fact, the percentage of oxygen in inspired air remains constant. It is a decrease in atmospheric pressure at altitude which reduces the partial pressure of inspired oxygen (See figure below). This is important, as the transfer of oxygen from the lungs to the blood requires a pressure gradient. That is, oxygen moves from an area of high pressure to one of lower pressure. At the summit of Mount Everest (8,848 m), atmospheric and partial pressure of oxygen are about one-third of sea-level values. This inhibits arterial blood oxygenation and so any exercise becomes far harder. Physiological compensation for this, often termed ‘acclimatization’, somewhat relieves this inability, and so does the use of supplemental oxygen. Partial pressure of oxygen in air, lungs and blood declines with altitude. 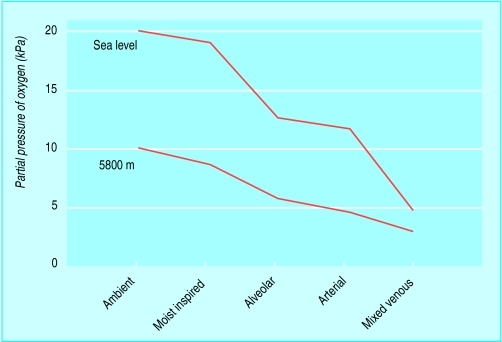 Diagram shows sample resting states at sea level and 5800 m. Peacock (1998). Performance at altitude varies widely from person to person, and it may not depend on prior fitness. Even a past gold-medal-winning cyclist may adapt more poorly than someone far less fit at sea level. Scientists do not yet fully understand all the factors involved. 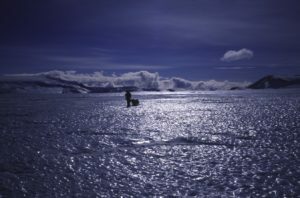 Even the great high altitude stars, Reinhold Messner and Peter Haebler, did not show physiological abilities at sea level that could explain their exceptional record at altitude. In addition, Pendleton was a sprint cyclist and thus largely an anaerobic beast. (Anaerobic means the performance of work without the presence of oxygen.) While potentially very fit, she may not have had a large or efficient aerobic engine, which could be important for success in high-altitude mountaineering. 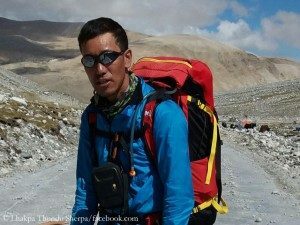 1 Comment on "Former Olympic Cyclist Forced to Abandon on Everest"